The ZiXue video player is a tool for people learning Standard Chinese and Chinese script. 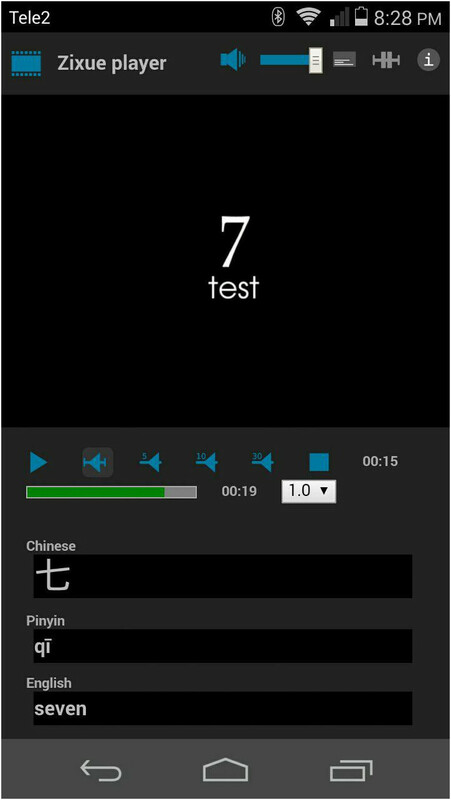 The player accepts local video and subtitle files and transcribes simplified or traditional Chinese subtitles to Pinyin in real-time. Auto-pause and replay based on subtitle timing make it easy to replay spoken sentences. The player also performs on demand dictionary lookup of individual characters and words. Although the player is loaded from this website, after downloading it is a standalone application that runs in your browser. The local video files you play do not leave your device. So playing a local movie doesn't cost you bandwidth, and what you play remains private. See the Privacy section below. Use the Chrome browser on your device to open the application. Choose "Add to homescreen" from the browser menu. Close the browser and open the player using the icon on the homescreen. Note that only files accessible on your device can be opened. This may or may not include cloud storage - mobile use is largely untested. This player uses the CC-CEDICT dictionary by MDBG. When you start playing your own files, this dictionary will be downloaded, processed and stored in your browser. This will take a couple of seconds. The processed dictionary will be available until the browser local storage for the player is cleared. Note that all these ways result in copyright infringement according to the law of about every country. I'm open for suggestions for legal alternatives. The subtitle language is taken from the file name. Subtitle files with names like themovie.zhs.srt and themovie.zhs.vtt are recognized as simplified Chinese, while themovie.zht.srt will be recognized as traditional Chinese. Aside from zhs and zht the following language identifiers are recognized: cn cns zhs zs chi chs or no identifier for Simplified Chinese and cnt zht zt cht for Traditional Chinese. The video and audio formats and codecs must be supported by the browser. If the video doesn't play or no audio can be heard try another browser or check if your system or browser needs to be configured to play the content. It might be necessary to convert the video using a tool like the opensource VLC. A safe bet is conversion of video towards MP4 using the H.264 or WEBM codecs, audio to stereo AAC, MP3 or Ogg and running Chrome. Other browsers will run, but might need additional configuration. If you encounter these issues, please don't blame the player or the browser. The root cause is a patent mess around about everything and anything that is needed to get content to people. Subtitle character encoding is automatically detected. If subtitles look garbled, try to open the subtitles with a text editor. Check the encoding (GB-2312, GB-18030, Big5). If the subtitles are readable in the editor, try saving to UTF-8. Firefox subtitle transcription works, but the timing is less exact than in Chrome due to the way Firefox handles	subtitle changes.